CAIRO—One of the more charming aspects of post-Mubarak Egypt is the frequency with which political debate erupts spontaneously between ordinary pedestrians, who are then quickly surrounded by dozens of on-listeners eager to hear competing points and, more often than not, interject their own. These deliberative blobs are the best indication that Egypt’s suddenly competitive political life is trickling down to the masses. But if you listen to the substance of the debates, you’ll discover that Egyptians are—quite understandably—disoriented by the rapidity and ambiguity of the latest political developments. But it’s not just Egyptians on the street who are having a hard time making sense of Morsi’s announcement. Even the country’s policy makers and political sophisticates are befuddled. That’s due, in part, to the inherent legal ambiguity of Morsi’s action, perhaps best captured in a press release from parliamentarian Mohamed Anwar Sadat declaring that, “the decision to reopen the dissolved Parliament is valid unless it contradicts with the law.” Indeed, it is hard to know what the law even is in Egypt right now: Egypt’s 1971 constitution has been replaced by two constitutional declarations that contradict one another in determining the proper election of Parliament and the timeframe within which Morsi should assume full executive power. 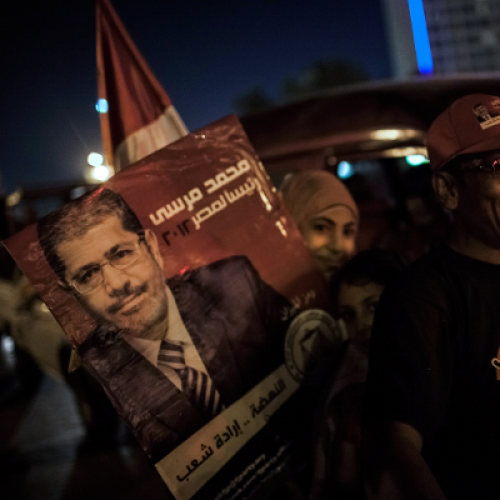 As a result, it is not clear whether Morsi’s call to reinstate parliament constitutes a legitimate exercise of executive authority, or an illegal override of the constitutional court’s ruling that led to parliament’s initial dissolution. But, as far as the Muslim Brotherhood is concerned, the confusion surrounding Morsi’s action is more prosaic. Morsi’s colleagues in the Muslim Brotherhood don’t yet feel prepared for another struggle against the Supreme Council of the Armed Forces (SCAF). “It was a surprise for everyone,” Brotherhood parliamentarian Huda Ghania told me during an interview at the Brotherhood-offshoot Freedom and Justice Party’s downtown Cairo headquarters. Situated directly across from Egypt’s notoriously brutal Interior Ministry, the three-story villa constitutes the Brotherhood’s architectural challenge to the junta. But the Brotherhood’s political challenge to the junta, Ghania indicated, would wait for another day, and she had been given no instructions on returning to parliament to support Morsi’s act. “[Parliamentary speaker] Saad al-Katatny will go to the parliament, check his calendar, and coordinate with his staff,” said Ghania, kicking the can down the road. Morsi’s timing similarly surprised Farid Ismail, a top Brotherhood parliamentarian who also sits on the organization’s policy-making shura committee. “I expected it, because the [junta’s] decision [to dissolve parliament] was unconstitutional,” Ismail said. “But not yesterday.” Ismail had attended a major shura council meeting this weekend alongside other parliamentary leaders and top Morsi advisers, but he said that the matter of restoring parliament had not been raised. “The meeting was focused on … implementing [Morsi’s] 100-day plan to solve urgent problems,” Ismail said, citing reducing traffic and improving security—but not restoring parliament. Further down the Brotherhood’s chain, youth activist Ammar al-Beltagi—the son of a prominent Brotherhood parliamentary figure—said that the Brotherhood seemed unenthusiastic about following Morsi’s lead in challenging the junta. “We can see that the president has raised the bar [vis-à-vis the junta],” he told me. “But the Brotherhood is still operating under its old limitations.” Though the Brotherhood had put out a press release calling for a “million-man march” to support Morsi, al-Beltagi said that the organization had not commanded its members to reoccupy Tahrir Square, as they did during the two weeks before Morsi’s election, and that only Cairo-based Muslim Brothers had been asked to attend. It is thus no wonder that, despite Morsi’s defiant restoration of the previously dissolved parliament, Egypt’s streets were mostly quiet, save for a minor earthquake that struck in the mid-afternoon. Tahrir Square was largely empty and, even around the parliament building itself, the security presence was not noticeably thicker. And why should it have been? Until the Muslim Brotherhood—and the broader Egyptian public—figures out what Morsi’s action means, the junta has nothing to fear.